To begin your sacred journey to wholeness, I offer basic meditation information with instructions that you'll need to get started. Essentially there are two different methods of meditation: structured and unstructured. For example, meditating simply on the flow of your breath is structured; meditating on the vast, sky-like nature of your mind would be considered unstructured. I always suggest that students begin with the first of the two types of meditation which is "structured" because the process of meditation is simple ... but not easy. There's a difference between simple and easy. When you are learning to meditate you use a structured method so the mind has parameters or structure already set-up for it; it's a more simple way for you to begin and maintain focus. One of the ways to meditate So... first sit-up straight, but get comfortable. Feel your spinal column in beautiful alignment. LIFT. Sense your breath. Slow down your breath. Actually, you're going to "watch" your breath. Yes, slow it down. After you read all of this general meditation information in this paragraph, close your eyes and practice with me... right here... right now. Did you notice I said to close your eyes? 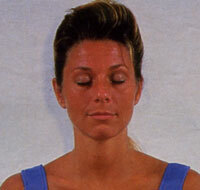 You do not have to close your eyes during meditation. However, when learning to meditate I suggest that you do so because otherwise you'll have more stimulus coming into your brain from your eyes (your sense of sight) and that will cause more distraction for you initially. Feel the presence of this moment. Be aware of how you feel. Sense your breath slowly flowing in and then slowly out at the vertical indentation space (between your top lip and the tip of your nose). Softly touch there under your nose with your index finger (second finger) to feel this location. This space is called the philtrum. Now... continue to breathe very slowly and consciously from your belly. Expand from your core and then shrink in your belly area gently as you exhale. "Watch" this process of breathing without judgement. If your mind starts to wander… hey... it's okay. Just gently bring your focus back to the task at hand: WATCHING your breath with "360" vision. Like a bird that flies to a perch for rest before flying away again... let your mind relax by focusing on the rhythm of your breath ~ IN and OUT ~ In and OUT. Avoid becoming upset if your mind is jumping around like a wild drunken monkey! This is normal in the beginning of your practice. Be patient and loving towards yourself. With compassion just keep returning your attention to the breath... methodically going in and out... in and out. You did it! Wow… you're thinking: that was simple. Gradually you'll practice 3-5 minutes... then build to 10 minutes at-a-time. Eventually you'll go into deeper types of meditation. Longer sessions are great, eventually half an hour... and then an hour, etc. The longer you practice and expand the ways to meditate, the more you'll relate to the possible challenges of this healing discipline. That means your mind may get restless and really wander. For ex., if you're completely re-decorating your apartment or house in your mind! during meditation practice then obviously you're not focusing on the structured technique (which in the example here for you was WATCHING the flow of your breath). In time, as your awareness is fine-tuned you'll "struggle" less and less with the focus as you dissolve the ego into a great space of primordial emptiness, of "all there is." Keep practicing... even in this present moment. 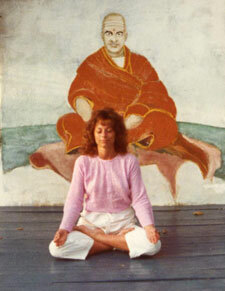 Then you'll move on into other types of meditation like unstructured methods. the "between" time, when Earth's energy has a palpable shift if you open up to its radiance. This is what meditation helps you to see... an all-encompassing view of life's radiance. Meditation Information: Learn Brainwave Technology: "alpha state"
Learning to Meditate: "Meditation is not what you think"
I'm at a retreat (early 1980s) in Nassau, Bahamas meditating "with" my dear guide, HH Master Sri Swami Sivananda. It's a lovely mural at the Sivananda Ashram. I trust you learned a bit more about the essential two types of meditation. Learning to meditate is such a vast topic and in today's challenging world, such a crucial one for our continued spiritual evolution. It's a pleasure to help you.